Internet sensation Grumpy Cat's epic feline frown has inspired legions of devoted fans. 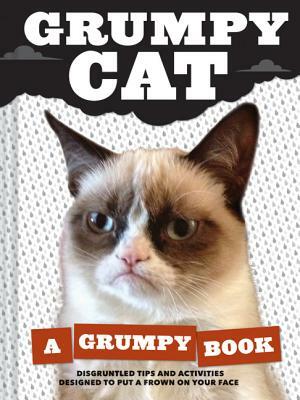 Celebrating the grouch in everyone, the Grumpy Cat book teaches the fine art of grumpiness and includes enough bad attitude to cast a dark cloud over the whole world. Featuring brand new as well as classic photos, and including grump-inspiring activities and games, Grumpy Cat delivers unmatched, hilarious grumpiness that puts any bad mood in perspective. Grumpy Cat is a small cat with a big frown who has inspired a hugely popular meme. With a sour expression that could stop traffic (and make it feel bad about itself), Grumpy Cat's talents include passing judgment, raining on parades, and making happy people grouchy. Grumpy Cat lives in Arizona. "an innovative concept, featuring unusual images of a feline that's become an Internet sensation. Subtitled 'Disgruntled Tips and Activities Designed to Put a Frown On Your Face,' the slim, colorful book is likely to make you frequently laugh out loud." "Grumpy Cat's online fame is undeniable. But cranky Luddite readers who cling sourly to the printed page can discover her charms ...with the arrival of 'Grumpy Cat: A Grumpy Book.' A Web star for our anxious times, Grumpy Cat also is an unofficial mascot for sufferers of bad-attitude resting face, which goes by another name that rhymes with itchy. Clearly, Grumpy Cat is currently our favorite peeved pet."